jet returnee | The land of soy sauce.... and Mothra! The land of soy sauce…. and Mothra! Hey there! Thanks for dropping by The land of soy sauce.... and Mothra!! Take a look around and grab the RSS feed to stay updated. See you around! Becoming an independent adult in a foreign country was quite the adventure, but I’ve had to spend the last year adjusting to the work culture and expectations as an adult in the U.S.
2. I can’t pay bills at the convenience store. I have to actually remember to write a check or pay online. And the late notices are less polite than in Japan. 3. Work doesn’t come home with me anymore. I don’t have an entire bookshelf dedicated to work materials. 4. Going to a Japanese restaurant/marketplace within the first few months of returning is not as fun as going about 6 months after returning. One year after returning is even more fun. It’s like going back in time. 5. I have to hold back the constant stream of “one time in Japan….” anecdotes. The struggle is real. I hope I don’t annoy too many people with stories. I do have times when I want to go back to my old life in Japan, but those moments fade away quickly. Japan isn’t going anywhere, and when I get the vacation time, I’ll definitely visit again. 1. “You got a fun degree, didn’t you?” Asked while applying for a position with a bank in the loan department. 2. “The JET Program was easy, wasn’t it?” Asked while applying to work in human resources for a Japanese company. These questions caught me completely off guard, mostly by the way they were asked, and I didn’t answer them very well. I think they go beyond the usual practice of asking something uncomfortable to see how you handle the situation, and get close to being insulting and condescending. I hope I don’t have to ever answer the above type of questions again, but if they do reappear, I’ll be prepared. 1. I worked hard for my degree. I persevered for 4 years to finish it with good grades, while working part time on the weekends. It taught me critical thinking, independence, new perspectives, and it has been useful. Also, I didn’t study just Japanese. I studied statistics, history, business writing, and linguistics. I have knowledge of many different fields because of my degree. 2. The JET Program is different for everyone. Personally, I was given a lot of responsibility in my position. Through my own research I learned how to lesson plan, coordinate with teachers, and make engaging lessons for my students. It wasn’t easy until the very end, after years of practice. Then I left to pursue new challenges. I like to think that if an employer can’t be positive about my past credentials, then I wouldn’t want to work for them anyway. We can’t all have degrees in business. The world needs liberal arts, too. If you advertise your language ability on your application, you may want to prepare for a situation like this! As I sit here this Thanksgiving Eve in America, I have a lot to be thankful for. Earlier this year I decided to not renew my contract on the JET Program and come home in July. 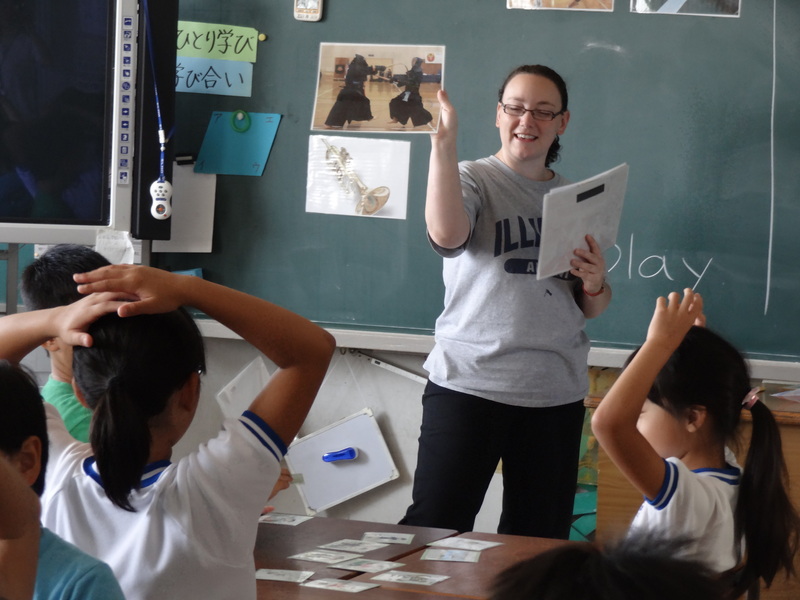 I had 3 great years in Japan teaching English, and while staying there permanently might be for some people, I knew after a couple years that it wasn’t for me. Before moving to Japan I spent 6 years studying Japanese and Japanese culture. I even got my B.A. in East Asian Languages and Cultures. From the moment I fell in love with the language I knew I had to live in Japan someday. I couldn’t afford to study abroad, but after the long application process I was lucky enough to be one of the people at Tokyo Orientation in 2011. During my three years in Japan I spent most of my time teaching, thinking about teaching, or making teaching materials. I had to overcome a lot of challenges at first just to do my job, then do my job well, and then finally I was able to enjoy it. I also spent a lot of time studying Japanese, sacrificing my Saturday mornings to study with a tutor. After a couple years of study I was able to pass the JLPT N2 level. I wouldn’t say I’m great at Japanese, but I can definitely hold a conversation and read a document, more than I could have done right out of college. The JET Program was a great experience, but coming back to the U.S. I was pretty worried about my job prospects. The economy hasn’t been that great, and even before the recession it was difficult to find a job with a B.A. in Japanese. I really wished I had paired my language skills with something practical, like business or computer science. So I was really surprised to find out that I was employable in the U.S. after coming back. People who can speak Japanese and are willing to learn some new skills are in demand, at least here in the Chicago area. I had three interviews with Japanese companies, and one job offer, which I happily accepted. I had been told so many times how difficult it was to get a good job with just a language degree, that I had psyched myself into thinking it would never happen. Now every day I get to use Japanese and English. I even help my Japanese coworkers adjust to living in a foreign country, something that I am extremely familiar with! My current job is probably just one of many as I create my career, but for now I am very thankful for it and my coworkers. Playing a game in elementary school.